Drawing Papers 136 - Hipkiss: Bulwark, the catalogue of the solo exhibition in 2018, with high-quality images of every work plus texts by the artists and the director. Currently out-of-stock, it is still available to read online. An email request to Kara (via the link on the page) might help hasten a reprint! 106 pages, $15 when in print, from The Center's bookshop. Dessiner l'Invisible, a group show that took place across several Paris galleries in 2015, was accompanied by this 704-page catalogue, featuring multiple images and an in-depth interview with each artist. In French. 40 euros, from Mindscape. The catalogue of Sternstunde, a group show at Galerie Michael Haas, Berlin, in 2016. Featuring high-quality colour plates of artists including Picasso, Warhol, Baselitz, Dix and many others, the inside cover shows sketches of our work, A∴C∴H∴E∴, as well as images of that and another drawing. 120 pages, 15 euros, from the gallery. 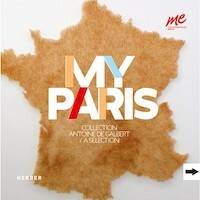 The catalogue of My Paris - Collection Antoine de Galbert / A Selection, a group show at me Collectors Room Berlin, in 2011-12. With high-quality colour plates of work by artists including Claire Fontaine, Damien Deroubaix, Gilles Barbier and Natascha Lesueur as well as an image of our drawing, Trois. 132 pages, 24.90 euros from Kerber. In German. Blanquet's 2009 large-format softcover book of Hipkiss from the first decade of the millennium. Quickly sold out, a few signed copies, with metal-leaf embellished covers, are still available from the studio. 32 pages, 100 euros plus shipping. See 'From the Studio' under the 'Shop' tab for more info.